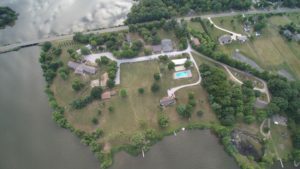 The facilities of Lake Springfield Christian Assembly indlue nearly 35 acres of great oaks, open grounds and is surrounded on 3 sides by Lake Springfield. LSCA offers several facilities for retreat guests and campers to enjoy. There a meeting spaces, dorm style sleeping and excellent food service is provided. We do not provide linens. Eagle Lodge is our newest facility. It is about 15,000 square feet and can accommodate 72 overnight guests. 110 guests can be seated at tables comfortably in the great room The larg deck provides a great view of the lake. The bulding is set up with 2 separate wings on each side of the great room, totally 6 rooms. Each room has spacious bathrooms. The great room is equipped with 2 fireplaces, seating areas, high top tables and a coffee counter. This building does have wifi, a projector and screen and is pre-wired for amplified sound. The lower level has a pool table, ping pong and air hockey. The Bridgeview Dorm (formerly called “the girl’s dorm”) has 2 separate sides providing year round climate controlled housing with beds for 48 in each (Side A and Side B). Each side has 4 rooms with bunk beds for 12 (11 twin and 1 full).